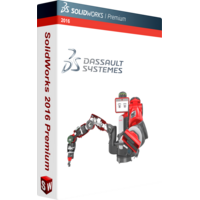 Solidworks 2016 Premium is the latest version of powerful software developed for simple introducing of ideas into viable projects. The application is specifically developed for technical designers. It provides a massive set of tools for part design, assembly visual creation, drawing, 2D and 3D modeling as well as tools for live presentations and simulations of planned projects. Along with tools for design, the software offers cost estimating and analysis tools, features for data rendering and animation of plans and drafts, tools for product data management. •	conceptual designing – this is an innovative way to design mechanical parts and whole vehicles as the software provides you all necessary tools to check the performance of the tool or a mechanism applying certain force or modeling certain conditions of exploitation. •	large designs enabled – the software allows to create really big and scaled designs with the working and project area being automatically optimized to the scale of the project thus making it more convenient for your eyes and actions to review the overall project. •	advanced modeling and surfacing – the software provides you a proper environment to create complex surface geometry. From this release you can also create stylish C2 surfaces with this software. •	sheet metal converting – the application enables you to convert projects as you need. Create the project draft from scratch, convert it into 3D model or into sheet metal design. The software will automatically calculate the deformations, loads and other specific features of behavior of sheet metal according the chosen type. •	pipe and tube systems design – the Solidworks 2016 Premium release is capable of creating everything you need for your mechanical project including pipes and tubes communication as well as the networks testing. •	parts and components online catalog – apart from using your own parts as templates you can browse online catalog to choose among standard parts. Be sure that the parts in the catalog are designed strictly keeping to the industry standards. Thus using parts and designs from catalog you can be sure that it will not harm or damage or distort overall mechanism or vehicle.